ISSUE SUMMARY LGBT older adults experience health disparities across four general areas: access to health care; HIV/AIDS; mental health; and chronic physical conditions. Additionally, extra taxation on retiree health insurance benefits means that many LGBT elders simply cannot afford to receive retiree health insurance. This is especially problematic given that LGBT older adults face a wide range of physical health disparities that are generally unaddressed by governments or health care providers. Source: Center for American Progress analysis of 2007 California Health Interview Survey data. 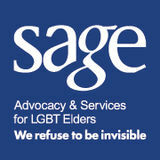 This issue brief complements the full report, Improving the Lives of LGBT Older Adults, available at www.lgbtmap.org and www.sageusa.org. LGBT OLDER ADULTS FACE UNADDRESSED PHYSICAL AND MENTAL HEALTH DISPARITIES Governments and service providers rarely track, and are largely unaware of, the health disparities among LGBT older adults. However, the limited available data suggest that later life carries unique health challenges for LGBT persons across HIV/AIDS, mental health and chronic physical conditions. •• HIV/AIDS: HIV diagnoses among those over 50 are on the rise, and the proportion of people living with AIDS in that age group is now more than double that of people under age 24.3 Yet there are almost no HIV prevention programs targeted at older adults, and health care providers do not generally talk to their older patients about HIV/AIDS risks. Additionally, older adults might suffer from the long-term effects of drug treatment for HIV/AIDS, such as increased and earlier chances of cognitive decline and increased risk of developing chronic conditions such as kidney failure, severe depression, cancer and osteoporosis. Finally, the management of HIV by older people can be also more difficult due to higher levels of chronic disease and multiple medications among older age groups. people have high rates of stress, much of which is related to systematic discrimination. Numerous studies have shown that the LGBT population as a whole experiences higher rates of smoking, alcohol use, drug use, suicide and depression. See Figure 2. Source: Center for American Progress, How to Close the LGBT Health Disparities Gap, 2009. Center for American Progress analysis of 2007 California Health Interview Survey data. •• CHRONIC PHYSICAL CONDITIONS: Studies suggest higher levels of chronic and other health problems among LGBT older adults, including asthma, diabetes, HIV/AIDS, obesity, rheumatoid arthritis and certain illnesses such as cancer.4 LGBT people are also more likely to delay testing and screening for certain illnesses such as heart disease and breast cancer. Left untested or undiagnosed too late, these chronic conditions can escalate to severe levels. See Figure 3. Source: Center for American Progress, How to Close the LGBT Health Disparities Gap, 2009. Figures represent the simple averages of smoking rates from multiple surveys and reports: Center for American Progress analysis of 2005 California Health Interview Survey data and Massachusetts Department of Public Health, The Health of Lesbian, Gay, Bisexual and Transgender (LGBT) Persons in Massachusetts (2009). US Centers for Disease Control, 2008. Barker, Herdt, and de Vries (2006); M. Adelman, J. Gurevitch, B. de Vries, and J. Blando, “Openhouse: Community Building and Research in the LGBT Aging Population,” in Kimmel, Rose and David (2006), pp. 247-264; J.C. Barker, “Lesbian Aging: An Agenda for Social Research,” Gay and Lesbian Aging: Research and Future Directions, 2004, pp 29-72. Source: Massachusetts Department of Public Health, The Health of Lesbian, Gay, Bisexual and Transgender (LGBT) Persons in Massachusetts, 2009. LGB adults are more likely to have cancer. States can also eliminate the state portion of the domestic partner benefits tax. Some states (such as New York) mimic federal tax guidelines and, by default, impose an additional state tax on domestic partner benefits. Note that state solutions are only necessary in the absence of a federal solution—eliminating the federal tax would also eliminate state taxes on these benefits. •• Ensure that new and existing federal and state studies and surveys on physical and mental health include LGBT people. •• Ensure that health care workers are trained on LGBT elder health disparities. Very little is known about aging, disease and longevity among transgender people. For some transgender people, long-term hormone use could interact with an aging body and related health issues and medications in ways that most health care providers do not know or understand. Some clinicians are concerned about higher risk of diabetes among transgender people undergoing hormone therapy; 5 high rates of polycystic ovarian disease6 and strokes among transgender men;7 and hypertension risk8 and blood clots in transgender women using progesterone and estrogen.9 A major health issue for transgender older adults is that Medicare generally does not cover transition-related care. This means transgender older adults who have undergone years of hormone therapy may suddenly find they cannot afford this care, despite the fact that abruptly stopping hormone treatment may be both physically and emotionally traumatic. •• Advocate for Medicare and Medicaid to cover transitionrelated and routine care for transgender older adults (insurance carriers routinely refuse coverage for medically necessary “transgender-related services,” and such exclusions are frequently expanded to prevent transgender people from accessing even routine care). •• Ensure coverage of procedures not normally associated with older men but common in older men with HIV/AIDS (e.g., Medicare has rejected treatment for osteoporosis in men with HIV; osteoporosis is a common side effect of many HIV medications). •• Include coverage for mental health services (due to the stress of living under pervasive discrimination). ABOUT THIS BRIEF This is one of a series of issue briefs based on content from Improving the Lives of LGBT Older Adults, a report which provides an in-depth examination of the issues facing LGBT elders, and potential solutions for improving their lives. For more information, visit www.lgbtmap.org or www.sageusa.org. 2215 Market St. • Denver, CO 80205 305 7th Avenue, 6th Floor • New York, NY 10001 1333 H Street NW, 10th Floor • Washington DC, 20005 www.lgbtmap.org www.sageusa.org www.americanprogress.org This issue brief complements the full report, Improving the Lives of LGBT Older Adults, available at www.lgbtmap.org and www.sageusa.org.